Doctor Strange is a hard character to write. There may be more bad Doctor Strange comic’s then good Doctor Strange comics. It’s safe to say that Steve Ditko did some of his finest work with Doctor Strange, which is saying a lot for the co-creator of Spider-Man. Ditko used the Master of the Mystic Arts as a voice for his own ideology and beliefs and the artwork was psychedelic and way ahead of its time. Those early story’s in Strange Tales were some of the coolest Silver Age comics Marvel ever produced. Roy Thomas had a nice run as well but it was marred by the fact that Doctor Strange was written more as a super hero then that master magician that he was. They even forced a mask on him, which never made any sense to me. 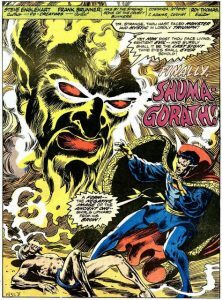 Doctor Strange appeared in the pages of Strange Tales and that book morphed into Doctor Strange volume 1 with issue #169 but ended shortly after with issue #183. Luckily Marvel made the decision to bring Doctor Strange back with a return to his more magical roots when they handed the character over to writer Steve Englehart and artist Frank Brunner. These two men helped reestablish Doctor Strange to his roots but also developed the characterization of the Sorcerer Supreme that is still used today. Steve Englehart is one of the finest writers ever to grace Marvel’s Bronze Age. His run on Captain America is a must for any fan of the character and he did more to develop the Falcon then any other creator. His times with the Avengers (both main book and West Coast team) are some wonderful stories but his Doctor Strange work was stellar. 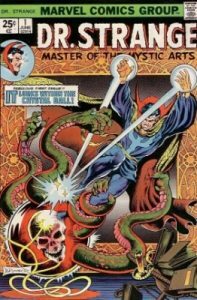 Joining Englehart for the relaunch of Doctor Strange was renowned horror artist Frank Brunner. Brunner was an excellent choice as Marvel was attempting to remove Doctor Strange from the superhero realm and return him to a more mystical role. Englehart and Brunner also added a horror element to the title. 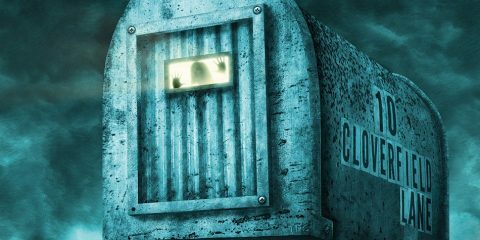 Prior to his work at Marvel Brunner had worked on the horror titles released by Warren such as Creepy, Eerie, and Vampirella. He brought his flair for the dark and the macabre to Doctor Strange:Master of the Mystic Arts and it help set the book apart from the mainstream Marvel Universe. Marvel brought their Master of the Mystic Arts back in the pages of Marvel Premiere, an anthology title that they used to try out characters before giving them their own book if it was warranted. Doctor Strange became the feature in Marvel Premier with issue #3 with a tale by Stan Lee and Barry Windsor Smith and remained the headliner until issue #14. Englehart and Brunner took over the title with issue #9 and quickly made their presence known. The set the stage for Doctor Strange to battle the immortal agent of chaos, Shuma-Gorath, who is attempting to take over the world by corrupting and possessing Doctor Strange’s teacher and current Sorcerer Supreme, the Ancient One. Doctor Strange is successful in defeating Shuma-Gorath but must destroy the Ancient One’s body to do so. With the loss of the Ancient One Shuma-Gorath no longer has a pathway to Earth. It also means that Doctor Strange must assume the roll of Earth’s Sorcerer Supreme. Englehart and Brunner next take Doctor Strange all the way back to the big bang in issues #13 & #14. 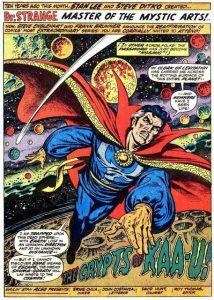 In these issues Doctor Strange battle’s with the rogue magician Sise-Neg (read his name backwards) who is attempting to go back in time to claim every magical energy on earth so he can recreate the earth in his image at the moment of the big bang. At the last moment Sise-Neg changes his mind and allows the big bang to continue as it originally happened. This storyline was apparently controversial at Marvel, so much so that Stan Lee wanted the two creators to pen an apology for the apparent use of God in their book. This retraction never saw print due to some quick thinking by the Englehart and Brunner who wrote a letter to Marvel on behalf of a fictions church who praised the storyline. The retraction never saw the light of day after that. After Marvel Premiere #14 Marvel launched volume 2 of Doctor Strange titled Doctor Strange: Master of the Mystic Arts. Brunner stayed on the art for the first five issues as they established the new Sorcerer Supreme. These issues are very trippy as the villainous Silver Dagger attacks Doctor Strange as well as his lover Clea and manservant Wong. Seemingly killed Doctor Strange is drawn into the Orb of Agamotto. Over the next few issues Doctor Strange travels deeper into the Orb as he try’s to find his way back to the living world to rescue his friends. His travels bring him into contact with manifestations of his teammates in the Defenders, he does battle with his arch nemesis Dormammu, and eventually Death herself. Doctor Strange is eventually triumphant and by the end of issue #5 he is well on his way to establishing himself as the new Sorcerer Supreme. Frank Brunner left after issue #5, replaced by Gene Colan who is a comic master in his own right. Englehart stays on the book for a few years and they are some excellent tales, all of which are worth reading for anyone who is a fan of Doctor Strange. As the world prepares for the upcoming debut of the MCU Doctor Strange it’s well worth your time and effort to go back and read the Englehart/Brunner run on the good Doctor. They are highly entertaining and a wonderful introduction to who Doctor Strange is as well as a manual in how to tell great Doctor Strange stories.